Bikes on Dorn Avenue at the start of the day. 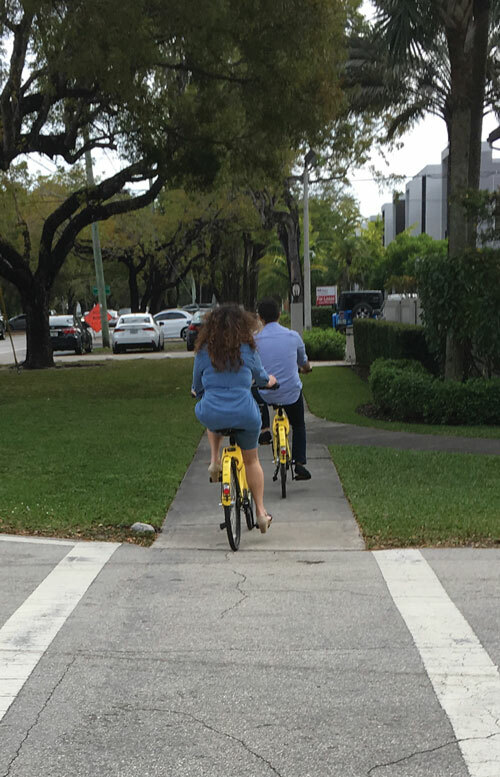 Like a swarm of locusts, yellow bicycles descended on South Miami streets in early November. With no advance notice by the city to the business community, many were left scratching their heads and complaints of bicycles scattered on sidewalks throughout the shopping and dining district resounded. Welcome to the world of bike sharing. Blue, green, red and yellow bikes can be found in many cities throughout the world. 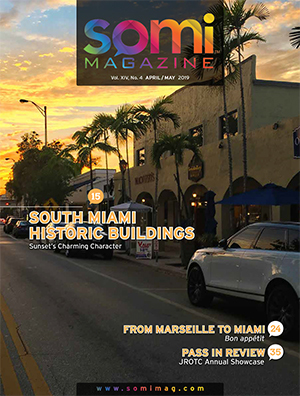 Noted to be a “bicycle-friendly community,” South Miami now joins Miami Beach, Miami, Doral, Surfside, and Bay Harbor Islands in providing bike-sharing. This is a part of the transit discussion of “first mile, last mile” access in multi-modality transportation considerations and remedial planning for the vehicular traffic gridlock. ofo (pronounced “oh-foh”) as the word resembles a cyclist on a bke, was founded in 2014 by five members of the Peking University cycling club. It’s CEO is Dai Wei, a 26-year-old entrepreneur, who created a bike-sharing community in rural China so kids could go to school. “That social mission is ingrained in us,” said Chris Nakutis Taylor, the head of ofo USA, who was previously a regional manager for Uber. On a recent afternoon, I met up with Gloria and Carlos Espina who were cycling the sidewalks along Red Road. They live in West Kendall and came to Sunset Place to get their bikes so they could enjoy a leisurely ride down Red Road. They find the service convenient for their needs, and don’t want to purchase bicycles of their own. Their one concern is they can’t reserve the bike for a number of hours, and could possibly lose the bike to someone else if they left it somewhere to grab a bite to eat. As of 2017. the Beijing-based bicycle sharing company, operates over 10 million yellow-colored bicycles in 250 cities and 20 countries, The dockless ofo system uses a smartphone app to unlock bicycles, charging an hourly rate for use. 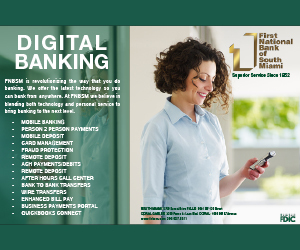 With an initial investment of 150,000 yuan ($21,800) to kick things off in 2015, as of 2017[update], the company is valued at $2 billion (CNBC report by Sophia Yan, Beijing Correspondent), and has over 32 million daily transactions. “We think ‘bicycle’ is the global language,” Dai said in the CNBC interview, pointing out that most of the world’s population can ride a bike. ofo‘s success has even attracted the attentions of Apple’s Tim Cook. The tech CEO visited the company’s offices in Beijing, after the bike app became the most popular on Apple’s China app store, boasting over half a million downloads a day. But the quick uptake has given way to yet another problem: The bikes are now polluting the public spaces, with mangled two-wheelers piled high on some sidewalks in urban spaces which is a public nuisance. Some cities fear that the uncontrolled introduction of these will bring chaos to sidewalks and plazas. Paris is moving to regulate bike sharing in the same way some cities are trying to clamp down on Airbnb’s growth. 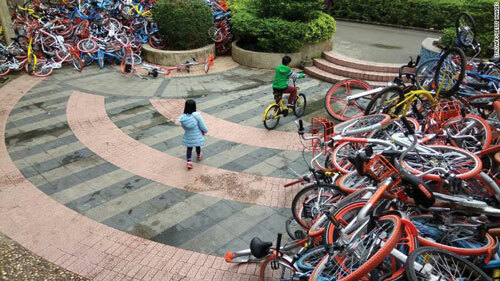 In Singapore, bikes in five dockless bike-sharing services will now have to be parked in particular zones, In Shanghai, police have confiscated thousands of illegally parked bikes; with photos were widely shared on the Internet. Rented bicycles from bike-sharing firms sit near the entrance of Xiashan park in Shenzhen, Guangdong on January 16, 2017. Customers use the company’s mobile app on their phones to locate nearby bicycles. Each bike has a code on the frame and are equipped with a smart lock on the rear wheel. Users can unlock the bikes by scanning a QR code on the bike using their phones. Rides cost $1 per hour. They use the bike and when they are finished, they leave it where their ride ends, and not at a “docking station” as with other bike-sharing systems such as Deco Bike and Citibike. 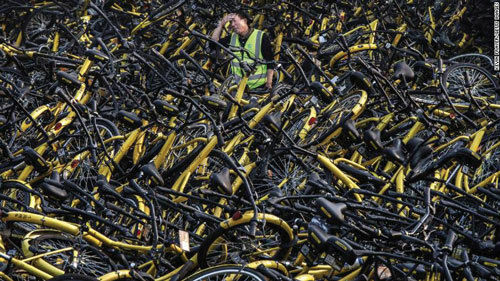 A mechanic from Ofo stands amongst damaged bicycles that were pulled off the streets and kept at a repair depot in Beijing. 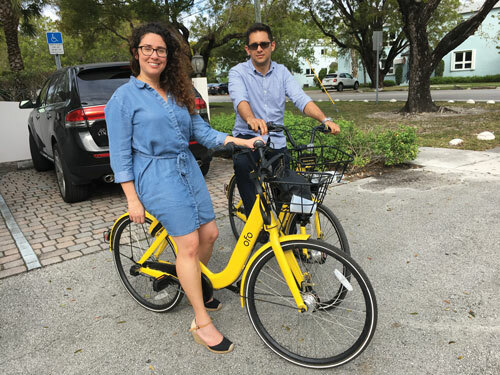 ofo came on the scene in Seattle in August, 2017, and has expanded to Washington, D.C., the greater Boston area, Dallas and Aurora, Colorado, and now its first foray in the Southeast here in South Miami. In conversation with Taylor Bennett, Head of Communications, North America, he noted that the USA is 3rd biggest market by total miles, with 275,000 miles ridden, operating in over 23 cities, with 20,000 bikes in operation. South Miami’s initial bicycle inventory was fifty bicycles. Bennett reports that now there are over 100 bicycles in the market, and the local team closely examining its data on usage patterns to facilitate the re-distribution of bicycles. 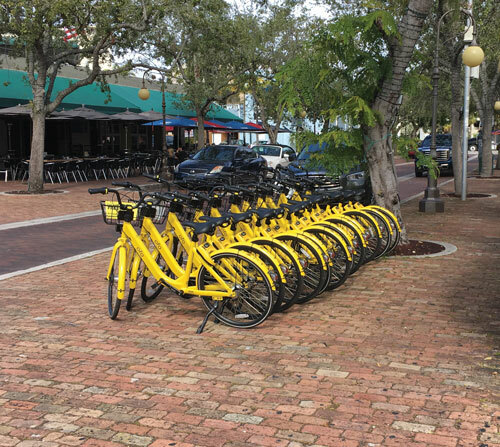 For communities like South Miami, using the dockless system requires no capital outlay by the company or participating community for a bike docking station. The ofo bicycling sharing pilot program of six months with the city is due to expire at the end of February. 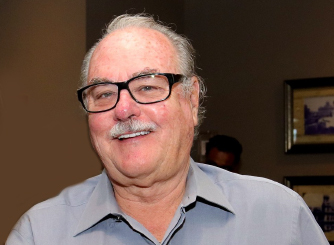 In commenting for this article, Mayor Stoddard noted, “Last weekend I was passed on the Red Road sidewalk by two young folks on yellow bikes, then two seniors on yellow bikes. 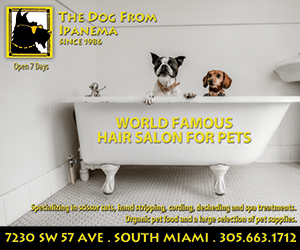 Everybody is using them.” Media sources for this article include: Bicycle Retailer Magazine, CNBC, CNN, Fortune Magazine and The Miami Herald.